According to the weather forecast, this weekend, it is going to be cold and cloudy with mild wind. On both Saturday and Sunday, the temperatures will vary between 8°C (46°F) and 11°C (52°F) during the day and may even drop to 2°C (35°F) after dark. LATINO FESTIVAL If you like Latin America, you need to visit the Latin Food and Music Festival at “Tiskarna na Vzduchu”, Areal Vystaviste 67, 17000 Prague 7. There will be a lots of fun, food (including a chili eating contest), live music, and of course dancing for the whole family including kids. The programme starts on Saturday at 11 a.m. and continues throughout the day until late at night. There is no entrance fee. Find the full programme and more information on the Facebook Event page. FAMILY EVENT On Saturday, you can take your family to the Prague Botanical Garden in Troja for a day of lumbermen. Enjoy the aroma of fresh-cut wood, see the real professionals at work, take part in fun contests, or taste a real wood-cutters’ goulash. The event takes place 11 a.m. – 4 p.m., and the entrance fee to the outdoor exposition area is 85,- CZK. Address: Trojska 800/196, Prague 7. Find more information on the Botanical Garden’s website or Facebook event page (unfortunately both in Czech language only). GASTRONOMY EVENT On Sunday, visit yet another of Prague’s Botanical Gardens to take a tour through the world of tea. In the garden, decorated with beautiful autumn colours, you can learn about tea and its preparation in a fun game style. You will also, of course, have the chance to sample various kinds of tea from all around the world. 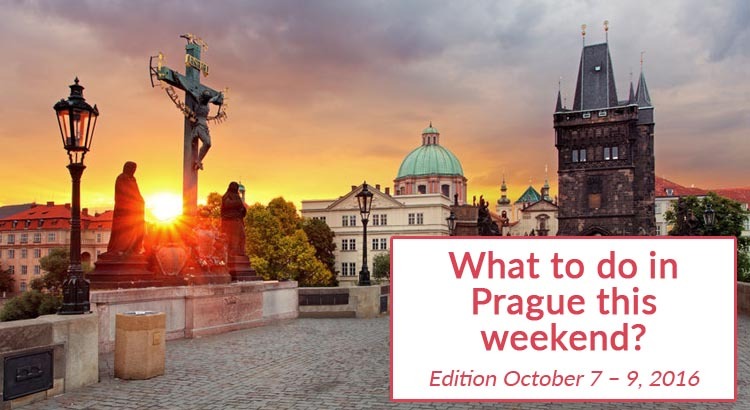 “Čajomír Trek”, the name of the event in Czech, is a special way to spend an autumn Sunday. The event takes place 9 a.m. – 5 p.m. (you can come anytime during this period). The entrance fee is 85,- CZK. Address: Botanicka zahrada hl. m. Prahy, Na Pazderce. Find more information on the Facebook event page (unfortunately in Czech language only). FAMILY EVENT On both Saturday and Sunday, you can enjoy a special family event, which will help you prepare for the upcoming festival of Halloween. In the gardening shop at Prague 6, you can learn how to carve a pumpkin and taste a rich variety of pumpkin dishes. There is going to be a rich accompanying programme for children, including face-painting, a juggling performance, or a fairy-tale characters “hunt”. The event takes place 9 a.m. – 6 p.m. on both days, and there is no entrance fee. Address: Chladek Gardening, Stresovicka 458/47, Prague 6. Find more information on the Facebook event page (unfortunately in Czech only). FAMILY EVENT On Saturday, take your children to test their courage and enjoy a lot of fun on the night trail in a haunted forest. The event, suitable for kids from the age of 4 years, will lead through the Záběhlice landscape park and will be full of bogeymen, dinosaurs, and other fun-scary characters. Children under 12 will go accompanied by their parents. The event takes place 6:30 p.m. – 11 p.m. The entrance fee is 50,- CZK. Address: K obecnem hajovnam 10, Prague 4. CONCERT On Saturday, the female choir Cancioneta Praga will perform their first concert of the season, in Prague’s New Town Hall (“Novoměstská radnice” in Czech). You can look forward to famous movie songs, African spirituals, and classic music in a repertoire which the Cancioneta Praga choir prepared for their upcoming South African tour. The concert starts at 7 p.m., the entrance fee is 250,- CZK, and you can purchase tickets online. Address: Novomestska radnice, Karlovo namesti 1/23, Prague 2. For more information visit the Facebook event page (unfortunately in Czech only). MEDITATION LECTURE On Sunday, a meditation course is taking place in the popular leisure time premises “Žluté lázně”. Anna and Jonathan, instructors trained in Thailand, will teach you the basics of meditation. The aim of the Vipassana meditation of insight is to help you cope with stress, wake up, and enjoy your life. The event takes place 9 a.m. – 12 a.m., and there is no entrance fee. Address: Podolske nabrezi, Prague 4. Find more information on the Zlute Lazne’s website. SEMINAR As part of his world tour “World Wide Wake Up 2016”, the renowned visionary and writer David Icke will hold a day-long seminar in Prague this Saturday. Find out why, according to him, there is so much poverty in the world, what are the causes of terrorism, who is in control of politics, and much more. The event takes place 10 a.m. – 10 p.m. The entrance fee is 1700,- / 2350,- CZK. Address: Lucerna, Štěpánská 61, Prague 1. EXHIBITION Before it leaves for its tour around Asia, you can see the famous Slav Epic in the Prague Trade Fair Palace (“Veletržní palác” in Czech). The series of twenty monumental canvases by the renowned Czech Art Nouveau painter Alfons Mucha depict the mythology and history of the Czechs and other Slavic peoples between 1910 and 1928. The exposition is open on both Saturday and Sunday, 10 a.m. – 6 p.m. The entrance fee is 180,- CZK. Find more info on the National Gallery in Prague website. EXHIBITION Also within the frame of the 700th birth anniversary of Charles IV, there is yet another ongoing exhibition taking place in the National Technical Museum of Prague (“Kostelní” street 42, Prague 7 – Holešovice). The exhibition, as its name suggests, focuses on the art of architecture during the reign of Charles IV, which was a great building boom. The exposition has been built up as a construction site, displaying contemporary building professions and technology. The full entrance fee is 190,- CZK. During weekends, the museum is open 10 a.m. – 6 p.m. You can see more info on the Museum web pages.